The Waddington Air Show was at the beginning of July but the same week was also the start of preparations for the Royal International Air Tattoo at Fairford. 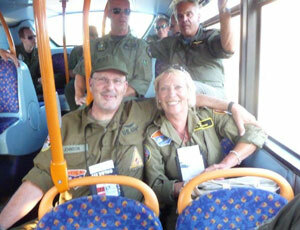 The motorhome/shop returned after Waddington to Wesham with Jo, Nina, Neil and I on board. 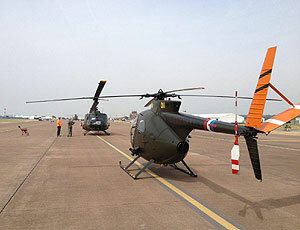 Rob and Phil were repositioning the helicopters to Coventry. On the Thursday Phil travelled down from Wesham to meet Rob who was to fly 509 to RIAT. Phil was to fly the Loach in. They set about the first phase of cleaning in preparation of the Concours d’Elegance competition for the static aircraft on show before going to the hotel for the night. Friday morning arrived and Phil and Rob were up early as they had an arrival time slot of 1030hrs at Fairford. Nina and I headed over to Wesham to meet up with Jo and hit the road with the shop. Jo settled behind the wheel and we headed off down the M55 to the M6 and on to Birmingham before picking up the M5. Off at junction 11A we headed south east towards Cirencester on the A417 which would eventually take us on to Fairford. By the time we had got through security and got our passes it was nearly two o’clock. Phil and Rob had got the aircraft to their allotted spot and had arranged for us to set up the shop between the two aircraft. We unhitched the trailer and parked the van in position and set about the Krypton Factor awning. This is a challenge at the best of times - on this occasion it was slightly trickier as there was quite a strong wind and the sun was beating down. Added to that, we were on the runway so we had to find other ways of holding down the awning. 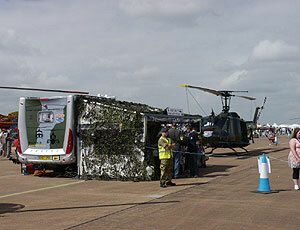 This we achieved with two large water containers full of water and the ground handling wheels off the Huey! Happy that the awning was secure we finished off cleaning the aircraft whilst awaiting the arrival of the cones and rope to cordon off the two helicopters. After they were set up we locked everything up and headed off in search of transport to the hotel. Phil, Jo, Nina and I would be on duty over the weekend helped by a further crew member (more on him later); Rob was otherwise disposed but would return on the Monday to fly Huey down to Exeter. Saturday was grey to start with a welcome breeze that helped to keep the temperature down. We arrived back at the airfield at 0840hrs. There was already a large crowd walking up and down past the static aircraft. The girls set about setting the shop up whilst Phil and I unlocked the Loach and Huey and started to window dress them. Helmets were placed on seats, ammo belts were attached to the various M60s and other bits of kit were put on or draped over the seats. Our new member of crew was taken out of the motorhome and placed in the rear door gunners well. 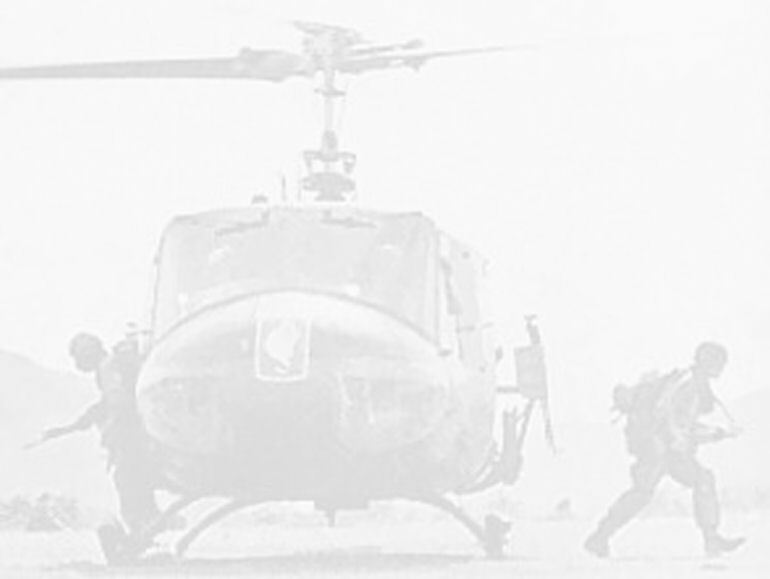 He was in US Army Vietnam fatigues and an SP4 flight helmet on his head (with the visor down), a pair of Corcoran jump boots on his feet and Nomex flight gloves on his hands. He was then attached to the M60 as though he was firing it. 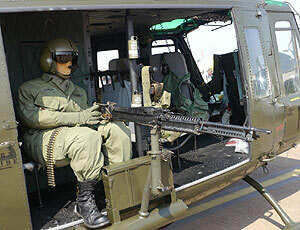 This would make the photos from the right side of the Huey a little more interesting. We also hid a Ghetto blaster in the Huey and played classic Vietnam era music, though it proved to be a losing battle as the air show tannoy system was too loud for us to compete with. It wasn’t long before Phil and I were talking to small crowds that had gathered by the rope. The girls were kept busy in the shop, not just selling key rings, baseball caps and the like, but also fielding questions about the two helicopters. Part way through the morning I felt a tug on my right sleeve accompanied with the words ‘I haven’t seen a flight suit or a pair of boots like that in a very long time’, all said with a soft American accent. I turned round and asked where that might have been and back came the reply ‘Saigon’. It turned out he had been a door gunner for three months. 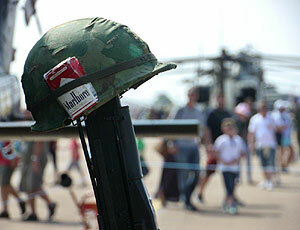 He said for him he had had a relatively easy war but knew that many were not so lucky. Before I could get any more details from him he thanked us for what we are doing with the Huey and the Loach and he was off. I hoped he might have passed by us on his way out but I didn’t see him, unfortunately. We were kept busy all morning and took it in shifts to go and get a bite to eat and have a quick look around some of the other aircraft. We were also in a prime position to watch the air displays taking place in front of us. There was a good variety of aircraft with some impressive displays from Typhoons, Vulcan, Chinook, Apache, the BBMF, Red Arrows, a Voight Corsair and beautifully polished aluminium B25 Mitchell. Still the crowds came and talked. Squadrons of Air Cadets came for a closer look as did other displaying aircrews from all countries. Two pilots who came up were from the The Royal Netherlands Solo Apache display team. Phil gave them the full two pound tour of both machines before they dragged us off kicking and screaming to take a closer look at the Apache attack helicopter they had on display. What an amazing machine it is, the technology and kit on board is just unbelievable. We didn’t want to leave but we knew we had to and it certainly whetted our appetite for the Cobra. On our return we were once again inundated with questions by an expectant crowd. One gentleman came up and started talking to us. He was a Londoner but began to talk very knowledgably about the Huey. From what he was saying it was obviously from first-hand experience. On further questioning it turned out he did a thirteen month tour in Vietnam with the American First Infantry, famously called the Big Red One after their regimental badge. He told us some very interesting stories and has agreed to meet up with us and the other English guys who served in the US military in Vietnam that we have met over the last couple of years. He was amazed when we told him we had found several others besides him - he thought he was the only one. As the day drew to a close we knew we had been busy as we only just made the last crew bus back to Swindon at eight o’clock. It was a noisy but enjoyable journey with the Dutch aircrew having a sing song with their, and some of our, favourite songs. Though at times it wasn’t what you would call tuneful! Sunday dawned slightly brighter than the Saturday and promised to be sunny from lunchtime onwards. 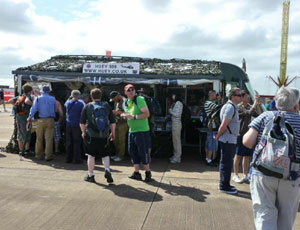 Once again the airfield was heaving when we arrived at a quarter to nine. In no time at all the shop was set up and the machines made to look their best. Though on the face of it it seemed to be not quite as busy as the day before as regards crowd numbers, there was no let up for us with people wanting to know more. I think the most popular question was ‘could they have their photograph taken with the M60 machine gun?’ So what about the helicopters then? Anyway a good day was had talking to all and sundry. The sun came out and the temperature rose. In no time at all the day was coming to an end with the Italian aerobatic team filling the sky with red, white and green smoke. Their Italian commentator got the award, as far as I was concerned, for the most entertaining commentary. His English with a strong Italian accent was just fantastic. We packed all the shop stock away and took down the awning. As always, frustratingly, it comes down much quicker than it goes up. 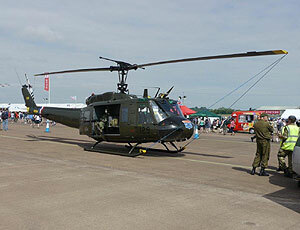 That done we packed the ground handling wheels into the back of the Huey and locked it and the Loach up. Phil was staying overnight as he was flying the Huey with Rob to Exeter before continuing to RNAS Culdrose for their Air Day on the Wednesday. Neil was to travel down on the Monday to fly the Loach back to Wesham. Jo once again jumped behind the wheel of the motorhome to take the rest of us back home to Lancashire.